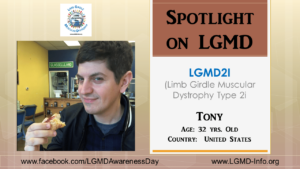 I was diagnosed with LGMD around the age of 26 at the Cleveland Clinic and then officially diagnosed with 2i last year through genetic testing. Looking back, I was always struggled to keep up a bit with other kids while playing sports, hiking, running, etc. My first noticeable “something might be up” symptoms started showing while I was touring the country with bands and loading gear every night about 10 years ago. I began to struggle a bit doing things I’d previously never had problems with (going up stairs without using a handrail, carrying large gear, etc.) I continued to notice small things getting more difficult through college but (of course) ignored it for years. Adjusting and adapting and giving up things I’ve greatly enjoyed. Having to be extremely careful with seemingly every single movement. I greatly miss things like going for a run (even if it wasn’t quite graceful), walking to get groceries, and just getting from point A to point B uninhibited. Finishing college after putting it on hold to play music and travel all over with my friends. Writing comedy for an independently released movie, web series, and book. Moving to Los Angeles and pursuing/accomplishing a career in entertainment/media and marrying the most perfect person for me in the world. It’s greatly improved my problem solving skills; making me more resourceful, creative, and patient. I’ve been able to apply that to my career and other parts of my life that have definitely made me a better teammate, friend, husband, and creative person. At least I think it has and I hope others would agree! A good start would be getting the entire world to know it actually exists. That it’s a major struggle for those affected but so many of us are living happy/productive lives, and there are treatments and cures on the horizon that we’d love everyone’s help and understanding in pushing them to the finish line. Man…I think about this constantly so I already have the day planned: I’d take my dog for a nice, long walk (maybe run?). I’d carry all the groceries in instead of needing my small wife to deal with it. I’d play hacky sack with some college dudes and maybe try this “hiking” thing that people in Los Angeles seem to love so much.